A decade ago, it was quite easy to find real bargains on eBay. Now that the site is a mainstream marketplace, most items actually sell for what you might expect they are worth — and sometimes much more. As the community of eBay buyers grows, it can be increasingly frustrating if you are looking for a really good deal. Since one of the real appeals of classic gaming is being able to experience a lot of gaming on a budget, I wanted to help everyone make the most of eBay and find the best deals possible. While some of these tips may be common knowledge to experienced eBayers, I hope that you can at least pull away a nugget of valuable info from this guide. If you have any additional tips to add, be sure to add them in the comments section below. If you plan on just searching and browsing around on eBay for good deal without a real purpose, you probably won’t accomplish much. Instead of flying blind, think of what exactly what items you want to build your collection. If it helps, make a wish list for yourself that lists all the exact items you want and put them in order of what you want most. Once you have defined goals for your shopping, think of all the search terms that could apply to your wish list. Some items may be listed under more that one term. Once you know what items you are looking for, you should establish what the going rate for those items may be. Luckily, eBay has a way to see exactly what items have been selling for over the last 30 days. Does The Condition of the Game Matter? If you are a meticulous collector, you probably want to have all your games in good condition and complete with boxes and manuals. If that is the case, this tip doesn’t really apply to you. However, if you only really care about the game itself (or maybe you just don’t care about the manual) be on the lookout for listing that feature cart-only, disc-only, missing manual, or broken case games. These little things matter a great deal to collectors, so if you could care less, you can get the game dirt cheap in most cases. 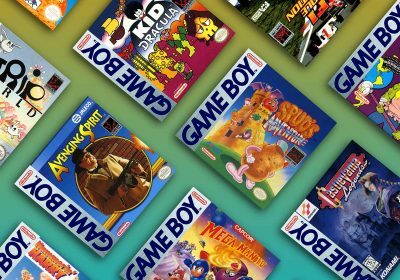 If you would like to see how much of a difference the condition of game makes in value for the most popular consoles history has to offer, take a look at this analysis I did on my article entitled, Comparing Massive Markups For Pristine Retro Games. 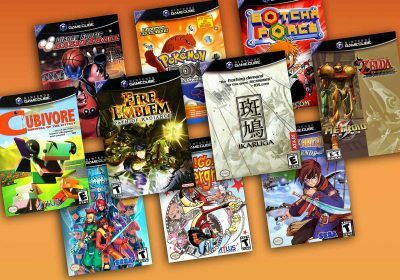 As you can see from that article, some newer games like those for the Dreamcast or Playstation will almost always come with cases, but every now and then somebody lists some disc-only games at a discount. 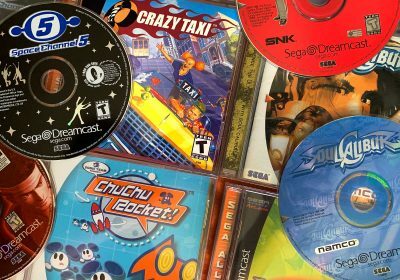 Some systems like the Saturn and Sega CD came in fragile cases that are now becoming a rarity, so those disc-only games should be relatively easy to find. On some occasions you might even see auctions for consoles where the seller specifically says that the machine isn’t working properly and they don’t have time to fix it. While console repairs are far from my specialty, I know of many people that can perform relatively quick and easy fixes on the machines to get them back to full health. (You can always ask questions in our Technical Help forum if you need help) Also, if for some reason you can’t get the machine working, you can always use the remaining parts for future repairs or use the cases for mod/repainting work. This is an old-school eBay trick and many other experienced eBay shoppers will be looking for these as well. However, it is still worth mentioning as it may just give you an edge over a few other people. Sometimes sellers may misspell the title of a game or system. (I’ve even seen people call a Sega Saturn a “Sega CD” machine). Obviously, it will be very challenging to think of every way a person could mistake the name of an item, but if you are serious about shopping for a certain game or system, think of the different ways it may be spelled or worded. Services like Missing-Auctions.com and MisspelledAuctions.com let you check eBay for item misspellings. There are also different variations on how people label different games and systems. Two popular examples are “SNES” vs “Super Nintendo” and “Playstation” vs “PS1” vs “PSOne” vs “PSX”. Be sure to think of the different ways people might list their items and search for them with the different variations. While video games may not have as much of a defined season as some products, there is a relatively surprising trend in overall game sales. As you can see from this article on Videogame Price Charts, there is a pretty large dip in game values starting in June and ending right before the Christmas rush. This came to a bit of a surprise to me as I always did more game buying in the summer when I was when I was out of school, but this just goes to show how much retail power the Christmas season really has. Not only do you have people buying hardware, games, and accessories in November and December, but you also have the recipients of those gifts buying additional items to complement their gift in January and the following months. This trend may have the strongest effect on newer games, but it should effect on older games as well. Just from my personally experiences in selling video cables for consoles likes the Genesis and Dreamcast, I’ve always been amazed on how many people mention that they are giving classic gaming goodies to their friends and family for Christmas. And as anybody that spends much time on eBay knows, shipping costs can add a lot to the final purchase price for the buyer. 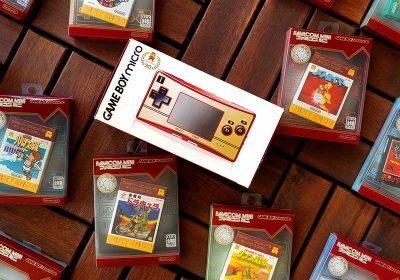 However, many times when somebody is cleaning out a lot of their old gaming stuff or the seller is has a dedicated eBay business, they may have many gaming auctions up at a given time and may be willing to combine shipping costs for multiple items in order to save you a lot of money. Once you have found an item that you would like to purchase, check out the seller’s other auction listings to see if they have anything else to offer. If they do, check in the item descriptions to see if they offer Combined Shipping discounts. Even if they don’t mention it but you are very interested in more than one of their auctions, it may very well be worth your time to send the seller an email to see if they combine shipping costs. Not only does it help when combining more than one auction, but you can also save on shipping costs and on the price of the items themselves when you purchase large groups of games and/or consoles. eBay is filled with people that are selling entire collections of games or just their whole set of console, accessories, and games for a given platform. While you might not want every single item in the lot, you should get a nice discount because every other bidder will probably be in the same boat. This is not only a great way to start a collection of your own, but you can also trade or sell off the items you don’t want as much. Again, this tip builds upon the ideas of the ones before it. If you are willing to bid on a large lot of games/systems/accessories, try to think of a few different games or items that would be for the same platform. Chances are that if they are relatively common, there are at least one or two auctions that have two or more of the items you desire. If you get a few items you would like in one auction, you might essentially get a few extra items for free. So how do you find auctions that have more than one item of interest in one auction? This might initially seem like a challenge as in most cases, the seller won’t be able to list every item in the auction title (which is what the standard eBay search is based off of). 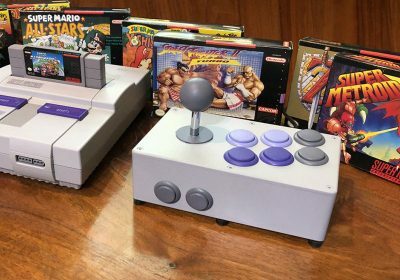 Let’s say you are in the market for a Super Nintendo system in addition to a few of its most popular games: Super Mario World, Super Metroid, and Pilotwings. If you want to test your luck, you could do a search (with title and description) for “Super Mario World Metroid Pilotwings”. This search will see if there are any auctions that include all three of those games. Unless this is your lucky day, you might not find any results. That’s ok, let’s try for two out of three. This time, take off Pilotwings – you may find two auctions that include those games. Not bad! If you want to be able to keep track of all the items you are interested in without having to keep going to the site and performing searches, you have two great options. First of all, you can sign up for eBay Favorite Searches email alerts. If you aren’t familiar with Favorite searches, check out this link. Once you have a search marked as a favorite, you can subscribe to some or all of your favorites via email alerts. With these alerts, eBay will send you an email summary of all the new auctions that were listed that day that meet your search criteria. The main downside of this method is that listings may be up to 24 hours old by the time you even have the email in your inbox. By the time you actually read it, somebody else may have snatched a cheap Buy It Now auction. If you need something quicker, you may want to look into RSS feeds. What is also nice about both the email and RSS notifications is that you never have to worry about missing an auction you were interested in as long as you check these alerts and they will save you a ton of time and effort. These are especially useful for searches that don’t turn up results very often. So if you’re still holding out for an auction that includes Super Mario World, Super Metroid, and Pilotwings, you can be alerted if it ever shows up. Or maybe you’re looking for an original steering wheel for an Outrun arcade machine or a Capcom Art Works book. With any of these instances, you subscribe to the alerts for these searches and be notified when these relatively rare auctions ever surface. Also, keep in mind that anything you can normally do on eBay to narrow your search (product categories, price ranges, Buy It Now etc) can be applied to your eBay email or RSS alerts. So if you only want to be notified if a certain item is listed under a certain price, you can trim down you notifications to those that really interest you. If you’re like me, “Buy It Now” purchases can seem a little too spontaneous. I’m the type that likes to add items to my Watch List and think about them for a little while before bidding. However, many times if you look back at the lowest sale prices on the Completed Auctions search (see above), you’ll notice that many of them we Buy It Now listings that got scooped up right away. I’ve been trying to get better about jumping on deals quickly, but it takes some dedication to beat your competition. If you combine a few of the tips above such with the RSS feeds and Email Alerts, you are bound to find some cheap Buy It Now before everyone else does. When you do, make sure you read over the description and terms fairly quickly to make sure you’re getting what you think and double-check the seller’s feedback. Once everything looks good, make sure to buy it before others have the chance. This controversial method is essentially waiting to the last possible moment to place your bid. This tactic is losing its effectiveness as your most dedicated of competition will probably do the same thing and will still bid the most they are willing to pay, but if you are interested in an item that wouldn’t appeal to most people, you may be able to grab the winning bid from an unsuspecting newbie. If you don’t want to hover over all your auctions yourself, there are a few websites that will help you in your strategy. Some services that have been recommended are AuctionStealer and GavelSnipe. These services and most others like them only let you do a few free snipes per month with paid upgrades available. Read Product Descriptions Carefully – The item title might sound great, but the auction might be missing something important or the item might be untested. Make sure you know what you’re getting into and it ensure yourself that it’s not too good to be true. Check Out The Seller’s Reputation. – I tend to deal with sellers who have sold at least 10 items on eBay and who have a satisfaction rating of at least 95 percent. If there are negative marks on the seller’s feedback, try to find some of them and see what the comments are. Sometimes a perfectly good seller will just be given back marks by some moron that just wanted to be a troll without a valid reason. On the other hand, if the feedback has one or more comments with valid concerns, you might want to look elsewhere. Keep An Eye On Shipping Costs – eBay is getting better about cracking down on shipping cost gougers, but always be sure to add shipping costs into your equation when determining if an auction is a good deal. 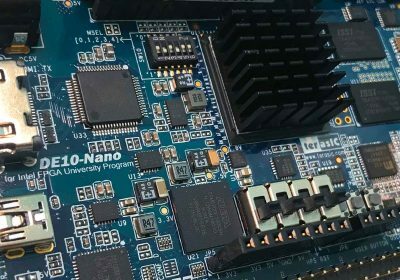 These costs can add up, especially when dealing with lots of hardware, accessories, or magazines. If the auction doesn’t list shipping costs, be sure to contact the seller. 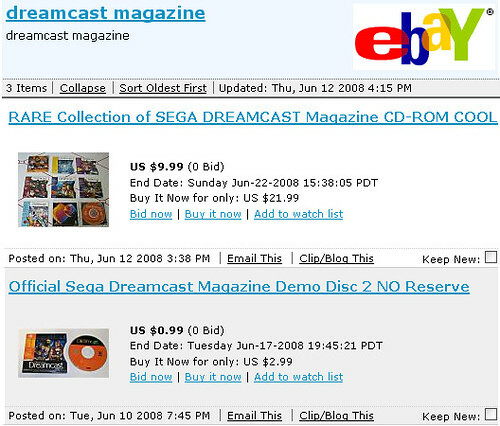 I also have a saved search for Dreamcast Magazine, actually mine might be Dreamcast Magazine Demo, but either way I find it funny because I bought the very same “Demo Disc 2 No Reserve” that you used for your picture. Small world. Excellent stuff, excellent. All I have to add, is that knowing an items average price (a very helpful bit of info really) can be achieved via Retro Gamer and Video Game Pricecharts .com. Even though I appreciate their service, VGPC also factors in Amazon and Half.com prices that tend to skew the values a bit from the eBay averages. I will use them for some quick analysis or for games that have a lot of listings, but for more rare items, I prefer to check eBay out myself. Also, many of us may be on the hunt for gaming items that aren’t indexed by both services. The exact opposite is true. If you always just search for specific items you’ll never make good deals on them. If you instead browse the categories you’re interested in (like Mega Drive games) you’ll stumble upon a lot of auctions that end lower than usual. You’ll even be able to get quite a lot of games for 1-2 bucks. Of course this only is true if you have a broad range of interests or want to go for a complete set. If you really only want to buy a certain game you obviously have to search for it. But what retro gamer out there is only interested in a certain game for a system?!? That is true to a point, but I do like to try to stay goal-oriented, personally. Also, the goals really come into play when using the email/rss alerts. It’s kinda hard to use those if you don’t have defined targets in mind. Another quick tip – you could try looking for promo copies of games. They usually have no manual and a cheap plastic case but they are the exact same game as the retail version. Even though I hate it when it happens to me, auction snipping is something to keep in mind. I have caught a few items with people sleeping and saved money. I always bid within the last minute. Works almost all the time. copy and past including: (). use the * in your searches. Especially for items that might be misspelled. remember, the less words, the more results. Lots of results, let’s refine to what we really want now. Well, you can use those features with broader searches. I’ve got a few dozen rss feeds on bloglines basically showing me all R7+ games auctions for the systems I’m interested in. I’m always very dubious when browsing Ebay – I tend not to trust buyers who say “I am an honest Ebayer” in their description. I always look for positive feedback first and the like. Pretty much everything on your list, BUT… I didn’t know about Favourite Search email alerts! That’s going to be very useful for me – thanks for that, Racketboy. I actually tried to bid on a copy of Gunstar Heroes on Ebay.co.uk but, seeing as I wasn’t the one on the computer, and the person who was isn’t exactly a computer wiz, it got snagged at the last minute; so I bought one on Ebay.com apparently used once and like brand new. I definetly agree about making a list of products to buy. My brother and I have a list of games and every few weeks we go on eBay runs for a few hours to see what is there. Since we sweep our buying periods usually pretty short but we cover a lot of ground. Did not pick up on the completed listings, thats a fantastic idea I will be sure to incorperate it into my usage patterns. 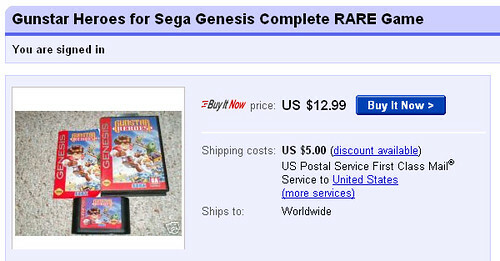 I think that another tip is to be suspicious of some of the fake or copied games sold on eBay as well. For some games that I am after I always find at least one suspicious, box art only from Taiwan which is know for its counterfeits. I don’t often bid on games where box arts serve as the only image unless the description states that they are pre-sealed. I agree that a focused list is the best plan of attach. One of my worst habits is browsing the items that are about to finish and bidding on things. Granted I’ve had a few bargains doing this but I often get buyers remorse when I’ve spent my money on cheap rare games that I’m not really going to play all that much. you can enter a minus sign (-) in front of search terms that you specifically do not want in the search results. for example, i was looking for a copy of worms armageddon. just searching “worms armageddon” yielded tons of results for other worms games, or the three pack that includes worms 2 and worms world party. changing the search to “worms armageddon -2 -world -party” narrowed down the results quite a bit. if you are on a strict budget like me then you may have a threshold price that you don’t want to exceed for an item you want. often i will place a single bid on an item. if the bid immediately jumps up past my offer (from other peoples’ reserve bids), i will move on to another of the same item and try it again. i’ll keep going until i get a bid that sticks. i may not always win that auction, but if i do i’ll know i got a great deal. the moral of this tip is that most common items will be auctioned again and again so don’t think you have to hike the bid way up to get that certain special item now now now. Here’s another site that might appeal to you and your readers. It was designed by a couple of gamers and geeks who grew frustrated with eBay. check out http://www.getitnext.com/ which will help you find what you’re looking for faster and easier than eBay. Best of all its free and no user id needed, and is certified by eBay. Here’s a couple of ways it can help find games and other cool stuff while saving you a ton of dough. Bulk Deals Search – based on feedback from users, GetItNext dot com developed a dedicated search that only returns auctions that return multiple items (lots, wholesale, bulk, etc.) Unlike eBay’s bulk search which requires advanced search techniques our Bulk search is simple to use. Want to jump start your PS3 collection try buying in bulk. Find a Deal Search – helps find bargains by returning listings with 0 bids with less than 4 hours remaining. Give it shot and let me know what ya think. I know I’m a little late but sometimes people don’t know what they have. I got Mega Man V for the GB for 5 bucks total, Mega Man IV for 8 and some others for dirt cheap. Patience pays off.